Do you have a big project in mind that will take a ton of time but all you can give it is an hour or so a day? That’s our situation – we are two full time workers with a needy house. This post details how just 90 minutes a day made a huge difference in one week! House projects were on hiatus for a bit while I traveled to see family in Illinois and shipped my latest project at work. We’re back in our routine now, and with a few weeks to go ’til Jim and I travel again it seemed like a great opportunity to knock off a project at home: painting the family room! The walls are dirty, scuffed, and just in need of a big freshen-up. Normally we’d grind this sort of thing out over a weekend, but this time we tried something different: do a bit each night, and maybe it’ll be done by weekend instead of just getting started on a Saturday morning. We’ll have to wash our brushes and clean up every night, but the tradeoff may be worth it. With just an hour and a half or so of time to dedicate to this project each evening, we didn’t have a minute to waste! Monday: Trim time! I painted the border around the carpet, Jim handled the trim around the slider. 1 hour and 30 mins later, most of our trim had its first coat. 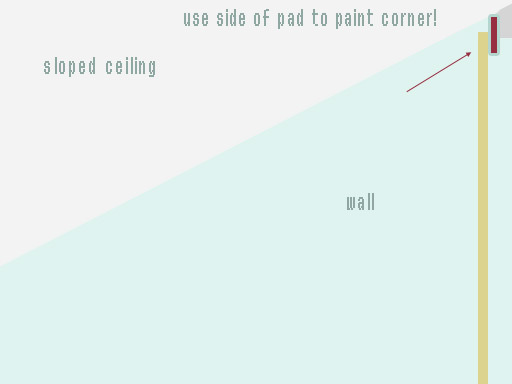 My trim-next-to-carpet technique: paint the top 80% or so of the trim with a thick coat of white paint (my particular color is known as “Popped Corn” – YUM! 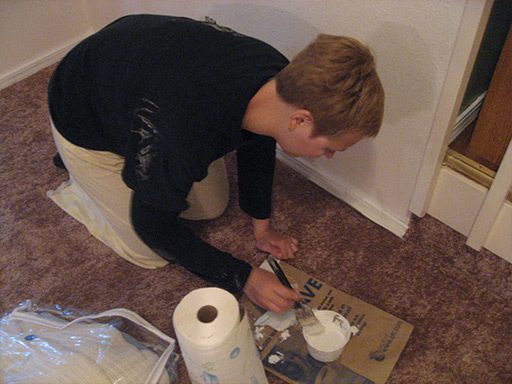 ), being careful not to paint the carpet. 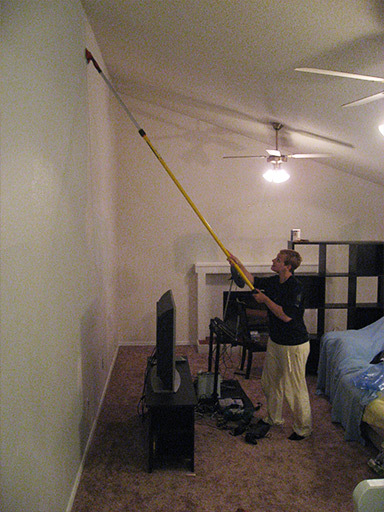 Once the first coat dries, return with a painting shield to jam between the carpet and the trim and do a second coat. Repeat in 12” segments around the room, moving the shield as you go. The first coat goes on fast, the finishing coat goes on slow, but it’s much faster than using the shield for both coats and no one notices the slightly thinner coat on the part of the trim that gets covered by carpet. Tuesday: Trim finishin’ time. I busted out the paint shield, stuffed it between trim and carpet, and worked my way around the entire room in 1-foot segments. It’s tedious, but when you paint after carpeting you take what you can get! The end result is crisp white woodwork against carpet. 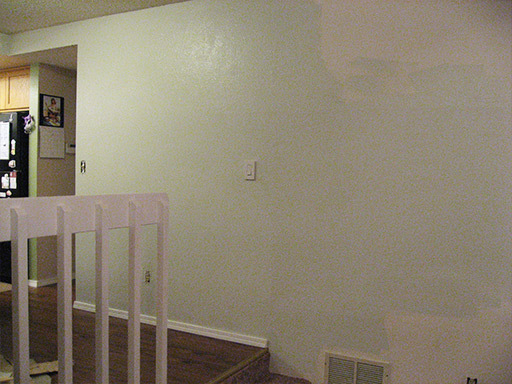 Jim painted the fence separating the family room from the kitchen. We only had about an hour this evening, bringing total time to 2:30. 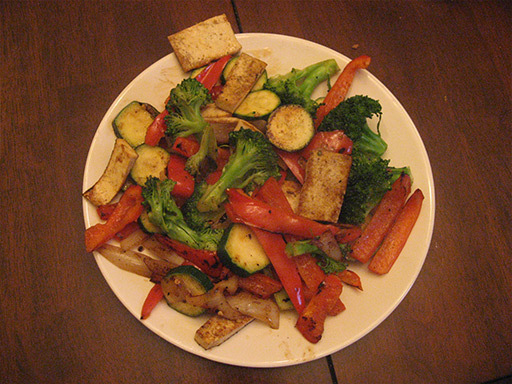 A pan fried stir fry of steamed broccoli, bell peppers, zucchini, onions, and Trader Joe’s high protein tofu. (I freakin’ love tofu… and everything else made of meat or a meat-like substance.) 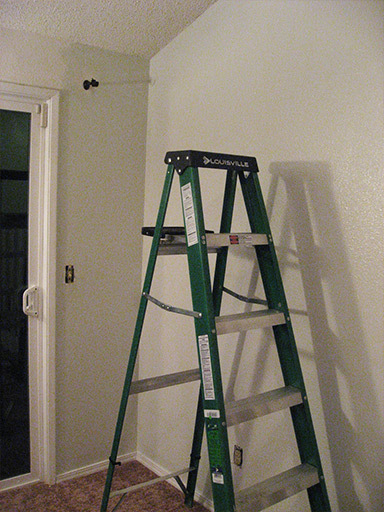 After dinner, we painted the rest of the tall wall. Total time: about 6:00 now, although for one of those hours we were at half staff as I painted during Jim’s call. 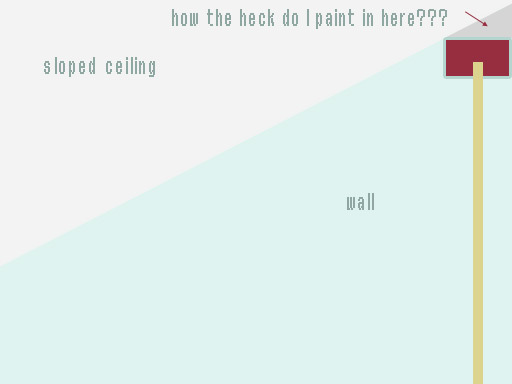 Friday: We painted the wall around the mantel. This went so freakishly fast I neglected to take any photos of it in progress. We started putting tools, sheets, etc away. Total time: about 7:00. We were stumped on this for a full day, and we even stopped at McLendon’s during our Saturday bike ride to see if they had a special angled pad for this kind of situation. Then I had a lightbulb moment – ah hah – the pad can be used sideways! Putting the paint on its edge and dragging it along like a thin brush worked like a charm and finished off our corners. VICTORY LAP! I painted the mantel using the same white I used on the trim. Just a thin coat to cover some of the wear and dirt, since it’s already white. Sunday: At last, we can use our family room again! Best of all, we didn’t spend a WHOLE DAY painting this room/getting exhausted/wishing we were having fun on our weekend instead. Having to wash the paint rollers and brushes every night wasn’t the time sink we thought it would be, either – and we have enough rollers and brushes to replace anything that was still damp the next day. 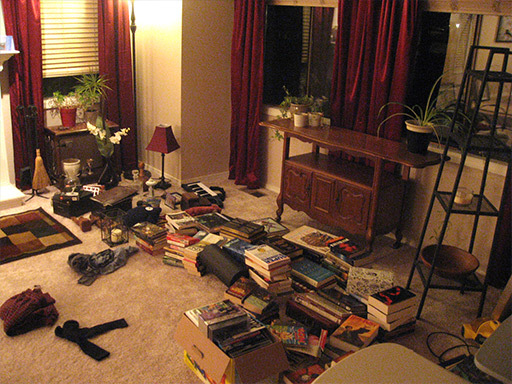 A better “after” will be posted once the room is fully back together! 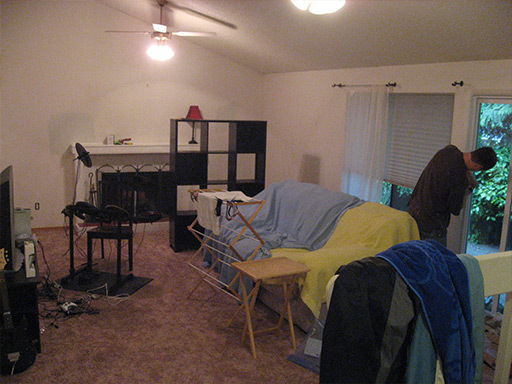 We’ve still got to replace some electrical outlets, cover the furnace intake, and haul a bunch of stuff back into the room.